Years ago I lived in Dundee, Scotland. During the long winters exercise was hard to come by, and bridies weren’t, so I had to find some kind of workout before I keeled over. Thankfully the city had a wonderful public swimming pool. It was 50 meters long, had plenty of lanes, was open late so I could use it after work, and was indoors and heated which made a welcome change from the freezing rain outside. I’ve had trouble finding anything as good in the American cities I’ve lived in, but after some detective work I have found a public pool I like here in San Francisco, the Mission Pool. There’s not much good information about it online though, and I found it a bit intimidating to go the first time, so I want to share what I discovered to help any other newbies who might find it daunting, and help it live up to its ‘Inclusion Center’ title! 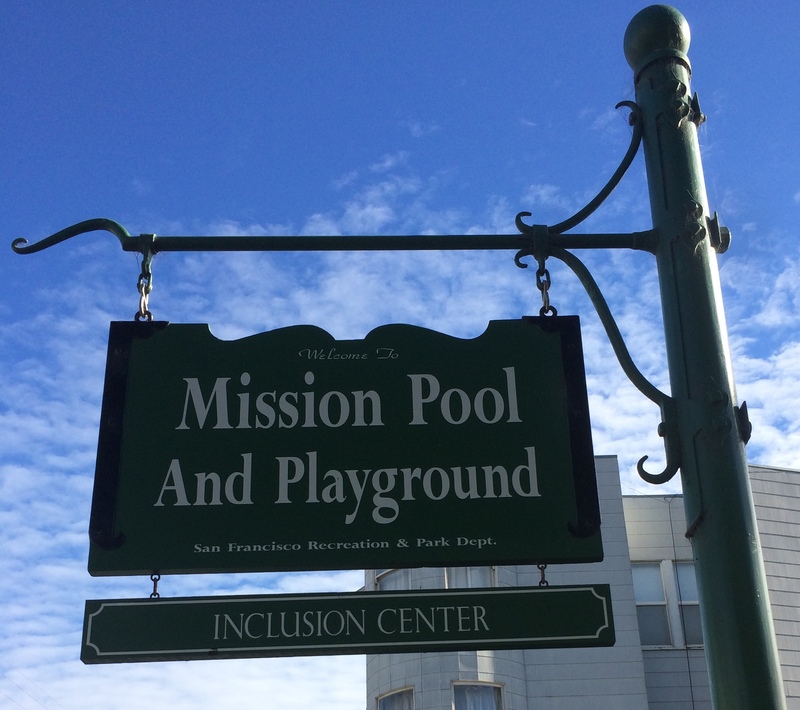 It’s located between Guerrero and Valencia off 19th Street (technically on Linda Street, but that’s just an alley), and you’ll see a sign for the Mission Pool and Playground outside. It’s an outdoor pool, but so far it hasn’t been too cold, even in chilly weather. It is closed December to March though, so it’s only got a couple of weeks left as I write this. There’s a schedule online of the sessions they run, I’ve only ever attended the lane swimming myself though. – The fee is $6, and you need exact change! There’s a corner store on 19th and Guerrero that I’ll often buy some water at to get the right money. The attendants push the money into a sealed box, so they really don’t have any change to give. – The lockers have no locks. I bought a cheap padlock that I use, but it’s also pretty common to bring your bag out to the poolside. It’s only accessible to other swimmers, so that feels pretty safe. – The two outside lanes tend to be used by slower swimmers, the two center ones are faster-paced. I’m not all that speedy so I usually hang in the slow lane. As a 25 meter public pool, most people are pretty chill recreational swimmers, so don’t worry if you’re slow too, you won’t feel out of place. – The etiquette is that you stay on the right side of your lane, so other people in it can pass you going the other way, or overtake if they need to. This does require a bit of cooperation, but everyone I’ve swum with has been very thoughtful and so it has worked surprisingly well. If you’re worried, hang out by the poolside first for a few minutes and you’ll see how it works. There’s usually only three or four swimmers in each lane, so it doesn’t feel crowded. – The pool is open to the elements so you get a few leaves blown in, but otherwise the water has been clean and not too chlorinated. If you forget your goggles, there’s a box of spares available too, they are a big help. After a long break from swimming it’s been fun to get back into it at the Mission Pool, so I hope this trail of breadcrumbs helps some other newbies discover this neighborhood gem. It’s turned into one of my favorite outings in the city, so I hope you get a chance to give it a try too! Any idea what the deal is with this pool in 2016? Would it be open in march/april anyway?